How Vancouver fares in the world of driverless metros? Thought the study seems to present numerous flaws, starting by a lack of common metric to measure the service regularity accross different systems, it tends to comfort some conlusion we have drawn previously in regard of the skytrain system reliability. The study presents this interesting matrice showing the service reliability as a function of the frequency. …and highlight the fact that a very high frequency system (The Paris subway line 14 has a frequency of one train every ~85s, while the Lille subway has a frequency of one train every ~60s. ), requires a very reliable system, something Vancouver could apparently not be able to achieve with its current system . We have already touched some words on the frequency issue, in our subway capacity post, and the great variance in dwelling time observed on the Vancouver network could negatively affect the network reliability. The pictures above could not all refers to the same snow fall day, but every snow day convey the same story: A transit meltdown when the city seems to not spare any energy to clear the bikeway network. Only ~50% of this route cover either a truck route or a frequent transit network route. and the crux of the underwhelming Vancouver snow response lies here: there is virtually no route priotization which leads to high inefficienies in the way snow removal equipment are deployed. the above map covers the frequent transit network, major truck route, hospital access, and the municipal “Disaster response” routes in the city limits: that represents ~200km of streets: 14 snow plowers can clear this entire network, one lane/direction, in ~1 hour (assuming a ~30km/h snow plow average speed): On friday, February 3rd, the total snow accumulation was ~12cm, falling at a rate of less than ~1cm/hr on average, and still the city let much more than 5cm of snow to accumulate on the main arterials such as Granville where the transit service was halted several time during the day…same on 41st and 49th avenue to speak only of few I have been made aware, not discounting the bus 20 was still not able to make south of 54th on February 8th. A similar transit meltdown occured on Monday 6th, total snow precipitation for the day: 7cm! another problem could be due to the deployment procedure of the snow plowing equipments: plowing takes place if there is more than 5cm of snow accumulation. The 5cm trigger is the same as in Toronto, however the level of water content in snow tend to be 50% higher on the west coast, so that the same level of snow precipitation leads to significantly more slushy condition in Vancouver than in Toronto …. Also, Toronto deploys snow plowing equipment as soon as 2cm of snow accumulates on its expressway networks. Ill conceived because the Surrey LRT approach is in essence local and ignore the regional demand. 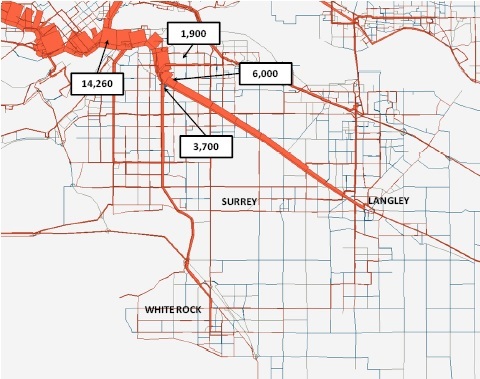 The region becoming more vast than Metro-Vancouver, people travel longer distance, with more dispersed destinations, the challenge is then to provide an appealing transit alternative for people in the Valley and the south Fraser area: that means, fast comfortable, and as few as possible transfer toward meaningful destinations. A LRT running not faster than a bus is not a compelling solution on which to build a regional transportation backbone, but a transportation mode such as the skytrain is not suitable for long distance travel; Also the skytrain technology, designed for very frequent service, become too expensive to maintain as soon as less frequent service is needed , so extending the skytrain forever is not a solution able to address the need beyond Langley. The expo line then needs to be extended 3km along King George to provide a seamless transfer with the regional train. Numbers suggest such a line could be built at cad$35M/km  putting the total cost of the regional line at $2.5Billions (remember that the Brunette interchange alone costs $0.5B). However, the line doesn’t need to be built in one shot, and can be phased, a first phase consisting of the 12km Langley-Surrey section, estimated then at ~$500M. The skytrain extension has been costed at $85M/km (2010) in viaduct and $140/km (2010)underground  (all including stations), so that the total cost of the project in its first phase could be keep in the $1B envelope, and still include a BRT lines Surrey 88th-Whiterock, as well as some B line connecting Guilford not only to Surrey central but also to the interurban and Coquitlam. The closest studied option by Translink was the option titled RRT 1A (skytrain extended to Langley and BRT on KGH and 104th): our proposed option in its first phase is slightly less appealing on the Langley Surrey section (doens’t go directly to Surrey center, and doesn’t eliminate the skytrain transfer). On the other hand, it still provides similar travel time, between the 2 cities (and Vancouver), and a tram-train option allow a finer coverage of Langley downtown. Subsequent extensions make our proposal of better value. Surrey Rapid transit Alternatives Analysis – Phase 2 Evaluation, Translink, 2012. 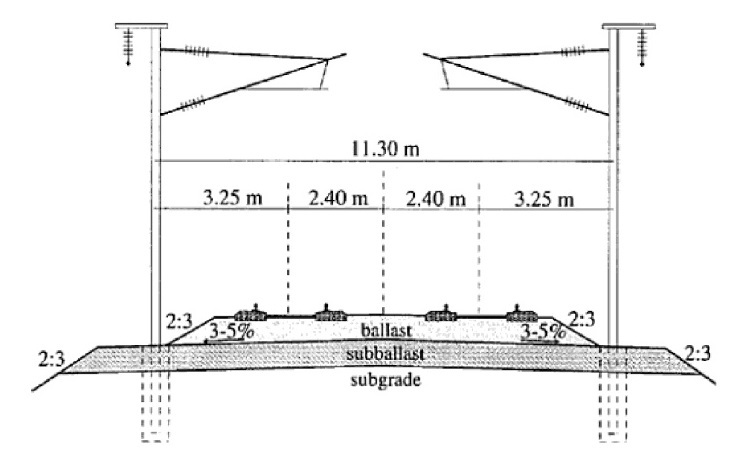 French high speed rail tracks have gradient of up to 35/100, and 40/1000 on the german Koln Rhein . Such choice, should not hinder the capacity of the line to run faster train. If electric, the tram-train should then be dual voltage, the main line, equipped with standard 25kv AC60Hz, the street extension in 750V. Similarly the stations should be designed to allow a layered service with tram train calling at local stations, while faster train could call only at main stations. The skytrain vehicles (and consists) are designed to maximize the throughout of the line, so seating is minimized, and comfort of it is not a priority. The driverless technology allow very high frequency at marginal cost, but it imposes also high “minimal operation” cost, to both maintain and operate the line, making this technology not a prime choice in the current condition. This tends to be a typical requirement for new regional transit lines in european conurbation. 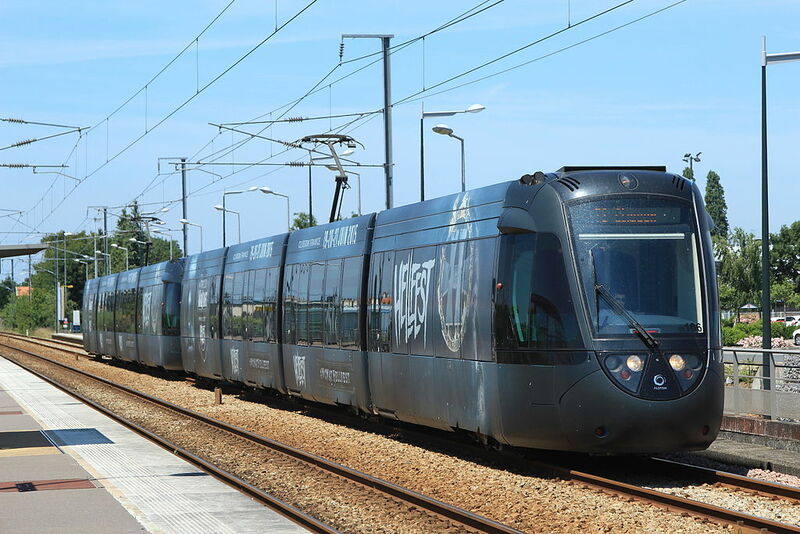 As an example the new subway line planned in Paris area are targetted to have a commercial speed of 55 to 65km/h. It is interesting to notice that the LRT line in Surrey is costed higher than a french High speed line, the later arguably incurring more extended civil engineering work: it is possibly due to the fact that Surrey LRT construction cost include the relocation of the underground utilities, and the construction method must include important traffic mitigation. Proponent’s environmental Assessment: Tehachapi Renewable Transmission Project, Southern California Edison, 2009, Figure 3.2.4. Camille Saïsset, Tram-train Nantes-Châteaubriant, une liaison efficace pour la réouverture de voies, Actu-Environnement, July 27, 2012. Lower Fraser Valley British Columbia, Chilliwack to Surrey Interurban, proposal fro rail for the Valley, David Cockle, Leewood Project, 2010. Reliability on the route 20 is a huge issue. Its lack of reliability stem essentially of its Hasting and Commercial Drive segment. Those segments are also the most detrimental to the speed of transit in this corridor. both speed and reliability are very signifcant factors affecting both the transit attractiveness and efficiency. The average bus 20 speed is 14.36km/h [1′, but in practice most of the riders will experiment a significantly lower average speed on the route busiest section. Below is the speed map for the bus 20 on an average weekday. Some remarks on the report to be presented to the Standing Committee on Planning, Transportation and Environment , On July 22. We were admittedly too optimistic to see the City elaborates on the above solution. Instead, The line of sight concerns expressed at the open house, have since been replaced by the concerns on the preservation of a cypress tree which could not have been endangered by a bus bay on the south side. We tend to see all that as excuses for inaction. Whether not, the restoration of the south bound bus stop on the North West corner of the intersection should have been in order. However, after feedback of the public, the initial proposal to move the South Bound bus stop further north has been given up. Instead, the bus stop will be moved south by half a block (from Burnaby to Drake). It is a step in the right direction, but insufficient: It seems nothing more than paying lip service: Transit accessibility is still much worse than it was in 2009 and before. This part was not presented at the open-house, and “popped up” afterward, the reasons why are unclear, since the City is supposed to have engaged with stack-holders ahead of the general public open-houses, where the issue could have been identified. Burrard bridge being such a iconic bridge, its alteration by suicide barriers, which also hinder the view of the bridge span, and affect negatively the user experience, raise some legitimate concerns from heritage groups. Overall, The Burrard North end project seems to be a bit rushed. Many medias, especially in North America, have reported the experience as failure, because the reported “suicide attempt” have increased by a 600% after the introduction of suicide prevention measure. However many observers consider the experience as successful, since the effective number of committed suicide has been reduced by 77% . One can conjecture that distressed people could target Mapo bridge, knowing they get a chance to be recognized as such and get helped. On the Authority side, it also help to locate those distressed people, and provide them with the needed help to prevent suicide in general. BC Transit Infrastructure Design Guidelines, Nov 2010.
 here we provide a design maximizing the line of sight. However, the required length of the line of sight could be shorter, allowing to reduce the angle of the bus bay. After the Transit plebisicite: what’s next? The voters gave a big resounding NO to the Mayor’s Transit plan. This plan was a draft which financial figures had never been finalized, what is against the South Coast British Columbia Transportation authority act, and could not have been approved in that form by the Council of Mayors for this very reason. In fact, even with the 0.5% pst increase, it was still not yet fully financed and was not sustainable in the long run . 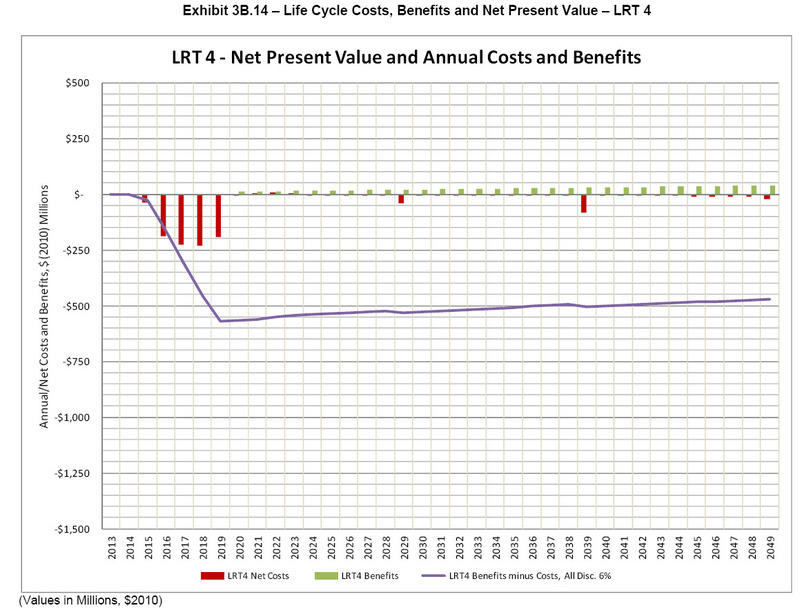 The lack of business case for some proposed services, starting by the Surrey LRT, could have cost so much tax $ in operating subsidies that not only a sunset clause for the tax was ruled out, but a new funding source could have been required before the end of the plan: The voter voted against that unsustainable path, knowing that anyway, there is always a Plan B, as alluded by the Surrey’s mayor. Beyond the plan and the question on ballot, is the referendum framing. The referendum was asking to approve a Translink budget: In democracy, a budget vote is a confidence vote in the authority in charge of the said budget. Forget the “No” side leaded by Jordan Bateman and the CTF, it is the region’s mayors which have called for Translink audits, Translink reforms…and fired the Translink CEO in the mist of the campaign, clearly putting translink governance at the heart of the Referendum. On the Translink vote of confidence, the Council of mayors largely echoed the Jordan Bateman‘s message: “Translink is broken”, so ditto! The stunning “No” side victory makes a Translink reform unavoidable. While, its Governance can certainly be improved, that will not rhyme with a better service. What can be done? In the 70’s, in Zurich, like in Vancouver, the voters have say “NO” to a grand and expensive Transit plan, and still Zurich has became the posterchild of efficient Transit. Eventually as Vancouver, a “No” vote was not a No vote to Transit. In fact Zurich said “YES” to measures able to improve Transit efficiency, speed and reliability (“Transit first plan”). 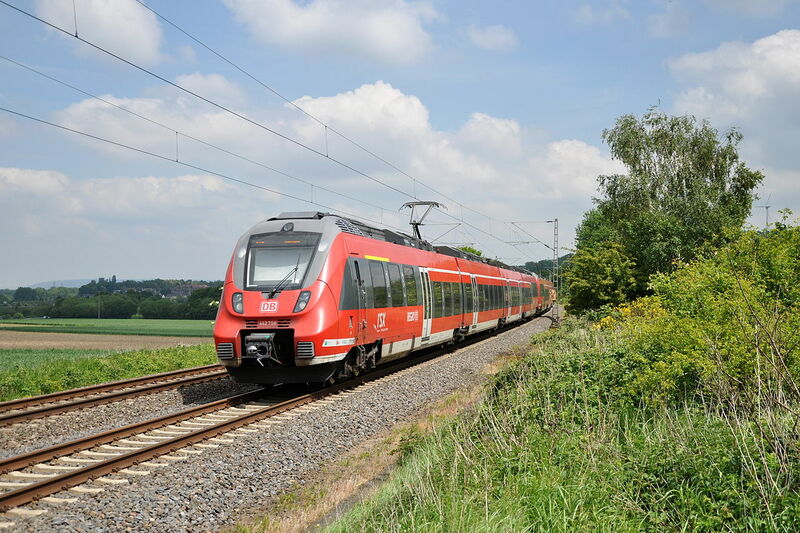 A Measures such as bus only lanes and signal priority can go a long way to improve service without breaking the bank, and help to build a solid business case for heavier rail investment. As an example, a newly painted bus lane on Seattle’s Battery street, has allowed to increase bus speed by 20%, and reliability by much more, what makes Transit less expensive to operate (bus driver are paid by the hour, not the mileage) which generated 20% additional ridership, hence increasing revenue: all these decrease the tax burden. Thanks to the still on-going federal gas tax program, bigger buses, be in the form of bi-articulated buses, like in Zurich, or longer articulated buses like introduced on Los Angeles’ Wilshire Blvd and in countless cities around the world, can also help to address overcrowding while keeping operating cost under control. All these don’t require as much money as political will from the mayors, whose are responsible for the streets used by buses. 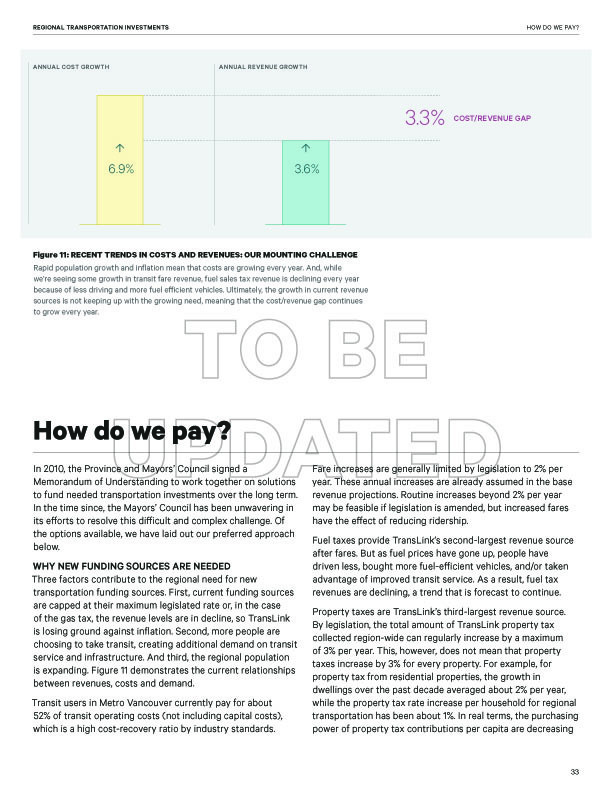 Will, which has been sorely missing in the region and especially in the city of Vancouver where bus service is clearly neglected by the current council but where also Translink spend 50% of all its bus budget. That doesn’t need to be. We have already exposed many ideas of Transit network optimization on this blog, and we will continue: Those can be a tough sell, but as we have already noticed, period of fiscal constraint are a window of opportunity to introduce network rationalization, and so build a solid fundation toward the expansion of Transit. In conclusion, the No to the referendum is an opportunity to rationalize our Transit network and to emulate the Zurich model. All in all, due to the non addressing of prohibited turns for active travel mode, the proposal looks more as a missed opportunity to improve connectivity for cyclists and pedestrians than a real improvment: in some sort, the whole exercise seems more guided by the ideological desire to remove a lane of traffic on the Burrrad bridge than anything else. All that could be not that bad if the proposal was not used as a weapon to attack the city buses once again. 400m Catchement area of bus stop considering the street grid and terrain elevation change: in green the Davie bus stop coverage. In red, the additional area covered by the Burnaby bus stop. In blue the area not covered any more due to the lost of the Pacific bus stop Southbound. Far to improve this dire situation, it is suggested to make it worse, by relocating the Burnaby bus stop ever farther away: the new Burnaby bus stop could be a mere 30 meter away of the Davie bus stop! In the present case, it looks like the removal of the slip lanes allow for ample room at the south-West intersection to implement a floating island concept with a bus bay (to not impediment traffic) as suggested in the second illustration of this post. a rule of thumb is to consider that 10 meters elevation change is equivalent, be in time or energy, to 100 meters distance on flat (e.g. the Grouse Grind hike is 2.8km long but with an elevation change of 853meter: that is equivalent to a hike of 11.43km (2.9km+ 10*0.853km) on a flat terrain.